This is a re-post of the ANZ Truckometer report for December , here with permission. 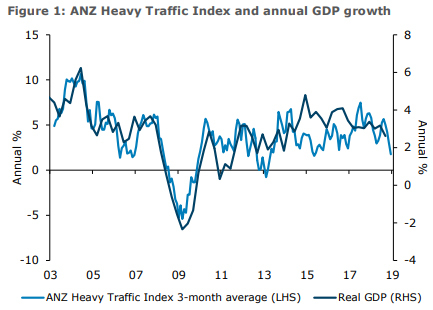 The ANZ Truckometer indexes weakened markedly in December, with falls in seasonally adjusted traffic flows on nearly all roads used in the two indexes. The Heavy Traffic Index fell 4.1% m/m on top of a 2.3% fall in November. It is now suggesting modest Q4 GDP growth. 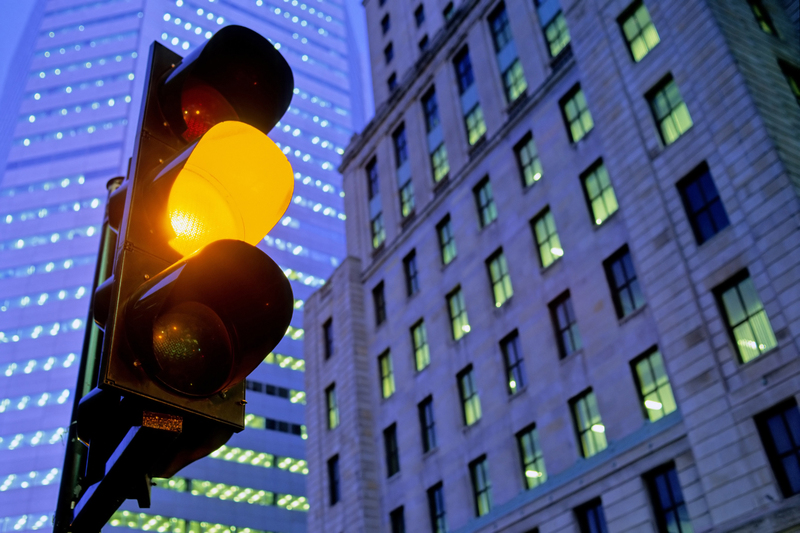 The Light Traffic Index fell 1.9% m/m, with recent reads consistent with the economy losing momentum. The data is volatile, particularly the Heavy Traffic Index, and it is too soon to call a change in trend. 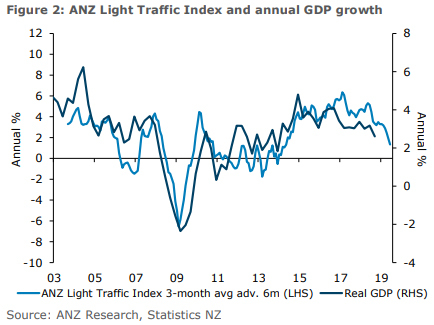 But the Truckometer indexes are now clearly flashing warning lights about a slower growth path for the New Zealand economy. 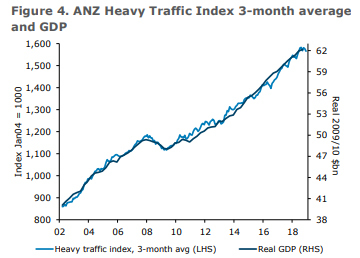 In level terms, once the data is smoothed to reduce noise, it is clear that the recent decline in the Heavy Traffic Index is nothing unusual. But the unsmoothed data (see page 3) shows that if we do not see a significant bounce-back the trend will soon start to decline more markedly. The very strong spring start to the dairy production season has influenced this data recently, as has expansion of dairy factories and subsequent changes in the transportation of dairy products. This is possibly causing some noise in the data and may contribute to revisions as seasonal factors gradually adapt. 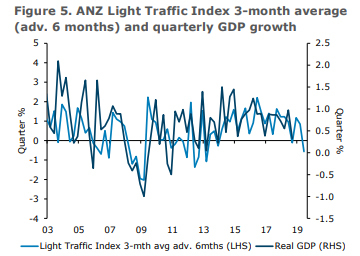 The Light Traffic Index gives a six-month lead on the direction of the economy and is best interpreted as a measure of momentum. It has given a fairly reliable read on growth over the past couple of years, and picked Q3 GDP quarterly growth well. 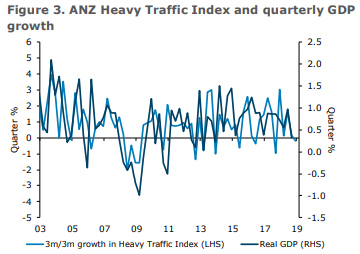 It is more optimistic about Q4 than the Heavy Traffic Index. However, it is sending warning signals about GDP growth into the middle of this year, given we’ve just seen the weakest quarterly growth in the Index since 2012. 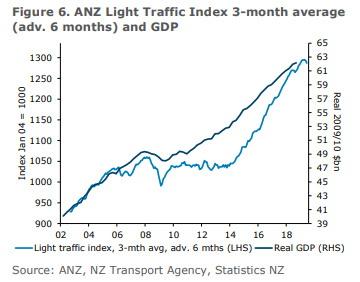 In level terms, the turn in the Light Traffic Index is more notable in that it is rarer, but again it is too soon to draw any strong conclusions. We will wait to see how large any bounce-back next month proves to be, with declining petrol prices likely to help out. That said, a loss of momentum over the second half of 2018 is clear here too, and it would take more than a one-month bounce to turn that around. The original report is here .